Developer Quote: "The local Movie Theater had just had its Grand Opening, and you are in charge of the Concessions Stand!" - Hot Dogs and Pretzels with Mustard and Ketchup! - Soda Machines with Cola and Lemonade! - A Cherry Classic Slurpee Machine! - Sweets like Twisters and Gummy Bears! Open Movie Rush! to dazzling movie theater glitter, including a film strip where you get to choose your level game! You'll see the concession counter where there's a soda machine on one side while you'll find pretzels and food on the other side. Behind the counter are the customers with the food items they are requesting listed above their heads. Let's start completing those orders! Be sure to fill the cup with soda before moving it onto the tray. Drag and drop the food on the tray also, then quickly swipe (drag and drop) the tray to the customer, but be quick! It's that simple, yet as the game progresses you'll see various types of foods requested in larger quantities, and the clock will be moving more quickly. 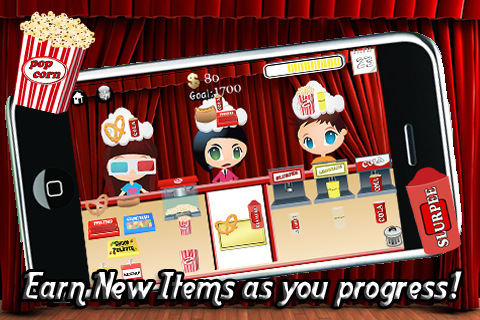 This movie game app is fun, colorful, and has realistic food and drink items. I love the sound of the soda machine while watching as the soda fills the cup. Lots of cuteness here! So what do you think? 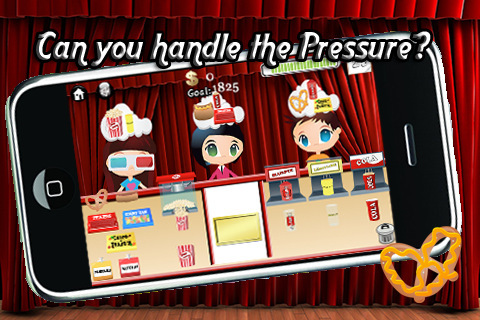 Can you take the Friday night rush at the theater's concession stand? Movie Rush! gives you a real taste of life in the movie theater concession business. COOL CONCLUSION: "Movie Rush! 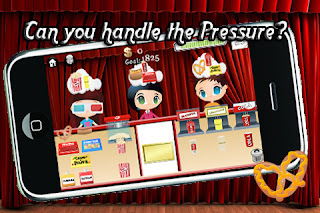 gets the adrenaline going as you rush to serve up realistic food and drinks quicker than you can blink your eyes!"